Simply put, Kindermusik is a music and movement program. 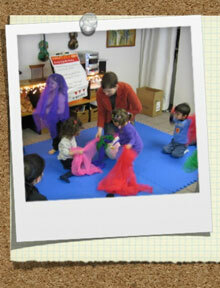 Each week in class children play, listen, and dance to music that will impact the parent and child in profound ways. That’s because every song, story, and two-step has a carefully chosen purpose in this creative curriculum—one that’s designed to stimulate and strengthen the vital neural wiring taking place in a child’s mind, right now. A Kindermusik-certified teacher at the Port Jefferson Music Academy will guide each parent and child every step of the way so you know how each activity contributes to your child’s overall growth and development. Village is for lap babies, crawlers and walkers. It incorporates the most current research on early childhood development and provides families a special place for learning and connecting with other parents and babies through music and movement. Young Child prepares the young child who is eager for first experiences with musical symbols and instrument discovery. Please note that the tuition for all kindermusik classes is $225 per 8 week session. With the exception of Young Child classes, take-home materials are included in the tuition price. Tuition discounts are available for families with siblings or for students taking multiple classes at the Port Jefferson Music Academy or at the UWS Creativity Center.